Patrick Kane celebrates his goal against the Los Angeles Kings during second period of Game 6 of the Western Conference Finals in Los Angeles Friday night. One thing we’ve managed to learn in the past two NHL postseasons is that a series isn’t over until the Chicago Blackhawks say its over. In dramatic come-from-behind fashion (could there be any other way? ), the Hawks forced a Game 7 in their Western Conference Finals series against the Los Angeles Kings after being down 3-1 two games ago. Game 6 Friday night went 4-3 in Chicago’s favor after they fell behind 3-2 to the Kings mid-way through the third period. Though that wasn’t the first time the Hawks were behind in this do-or-die game. The Kings struck first when Dwight King netted home a wrist shot at the 17 minute, 3 second mark of the first period and the home team kept that 1-0 lead after another tough 20 minutes for the Hawks at the Staples Center. As the second period began, Patrick Kane made his first real mark on the series, scoring seventh goal of the playoffs on the power play (1:12) to tie the score, but the Hawks weren’t done. Unsung hero Ben Smith scored his fourth goal of the playoffs and his second in the last two games (2:49) giving the road team a 2-1 lead after a very successful couple of minutes. With Game 6 officially in the “tightly contested” category, the third period was set up for a fantastic finish. Kings defenseman Drew Doughty, looking more and more impressive as the series progresses, scored off a Hawks turnover and a nice pass from captain Dustin Brown at 5:32, tying the score at 2-2 and after the Hawks’ Jonathan Toews was called for hooking against Marian Gaborik which led to a power play goal from Alec Martinez, a wrister that gave the Kings a 3-2 lead at 7:38. The defending champs kicked things into another gear as defenseman Duncan Keith scored his fourth goal of the playoffs and first of this series (11:34) off a sweet pass from Patrick Kane to tie the score at 3-3 and the game’s final swing played out just a couple of minutes later. 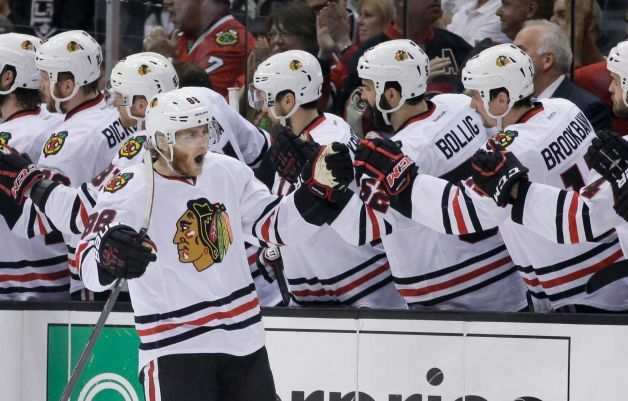 Displaying some of his best showtime moves, Kane put Chicago over the top with his eighth goal of the playoffs and second of the game with a nice assist from Brandon Saad setting him up and the game’s 4-3 final was set. The Kings would make one last push, including a great flurry of shots in front of Hawks goalie Corey Crawford in the final minute, but it wasn’t enough as Chicago’s defense stood tall and wide. Crawford was outstanding, especially in those all-important last few minutes after the Hawks took their 4-3 lead. A meaningful moment happened towards the end of the second period Crawford’s counterpart, Kings goalie Jonathan Quick, made a half-hearted attempt to bait Crawford into a fight after a scrum took place in Quick’s net, knocking him over. Crow actually shook his gloves, letting Quick know that they can come off easily and something could get started. As Quick stood down, you could argue so did his team. In all, Crawford stopped 26 of 29 shots for a save percentage of .897 while Quick played well but just like in Game 5, just wasn’t good enough, collecting 21 saves while posting a .840 save percentage. CHI — Brent Seabrook scored 2 assists. CHI — Andrew Shaw made one assist. CHI — Went 1-2 on the power play. CHI — Michal Rozsival lead the team in hits (6). LA — Justin Williams, Dustin Brown and Mike Richards each made one assist. LA — Tanner Pearson and Willie Mitchell tied for the team lead in hits (6). The Kings’ Anze Kopitar hangs his head after time expires in Game 6 Friday night. CHI — Marian Hossa scored 0 points, he has yet to score a goal this series and hasn’t scored at all since making an assist in Game 3. LA — Marian Gaborik and Anze Kopitar combined for 0 points. LA — That 70’s Line of Tanner Pearson, Tyler Pearson and Jeff Carter combined for 0 points for the first time this series.